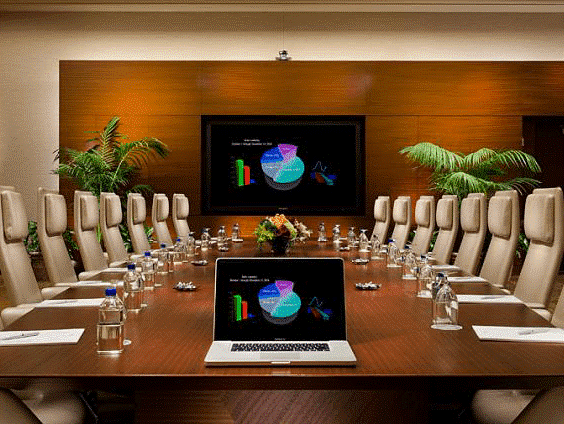 Communication and visuals are always key in the board room or conference	room. Depending on the size of the space, the right size flat panel can	have many functions and work as a great display. For larger rooms, a ceiling-mounted	projector and motorized screen may be the solution. Video conferencing systems such as Nearus, Tanburg, and Skype can be interfaced	with wall mounted flat panel display for a face to face conference whenever	it’s needed. Sharing your laptop’s display on your conference	room flat panel TV or projector can be simple with the proper installation. The “wow-factor” can go a long way. A flat panel TV lifts out	of the conference table or projector and screen drop down from the ceiling	to add convenience and maximize space. With years of experience, Intuitive	AV can help weigh the options and determine the best solution for each space.